Once believed to be the indigenous religion of Tibet, Bon is believed to have been around as a religious teaching and way of life for more than 18,000 years. Similar in form to Buddhism, in the 7th century, when the Buddhist teachings first came to Tibet and were recognized as the national religion, many of the proponents of this ancient yet modern religion were incorporated into the Buddhist traditions that now make up Tibetan Buddhism. One of the most important is the New Year Festival known as Losar, which is believed to have originated in the ancient Bon religion more than a thousand years before Buddhism came to the plateau. Modern Bon is very similar to Tibetan Buddhism, so much so that there is a wealth of controversy surrounding the ideas of whether Bon influenced Tibetan Buddhism or vice versa. The modern version of the Bon religion came about in the 14th century, after the second diffusion of Buddhism in Tibet, and many scholars regard it as the “ancient new religion”, as many of the scriptures used in Modern Bon come from “termas”, the hidden teachings discovered by “tertons”, the discoverers of those hidden teachings. Ancient because the texts tell of the time of Tonpa Shenrab Miwoche, the popularly credited “founder” of Bon, yet has been only recently “discovered” by the tertons since the 11th century. While many scholars speak of just two stages of Bon, the Original Bon and the Modern Bon, the Bonpo themselves tell of a stage of Bon that lies between the Original and the Modern stages, known as the Yungdrung Bon. The exact nature of Original Bon is very hard to determine, since all descriptions have been given in Buddhist texts, and from a Tibetan Buddhist perspective, which sought to discredit the religion as fake across the plateau since the 7th century. In the Bon timeline, Original Bon came first, and was an animistic and shamanistic set of beliefs that had little to do with an organized religion. The people that practiced Original Bon believed that nature was pervaded by both good and evil spirits, and where the Bon shamans would use mind-altering smoke to reach an altered state of consciousness in order to channel transcendental energies from the spirit world to the mortal plane. The name, Bon, came about much later, and it is believed to have been derived from the ritual reciting of the practitioners. The word, Bon, means “invocation”. Modern Bon came about in the 145th century, after many centuries of persecution by the Buddhist lamas of Tibet, despite it having been a major influence in many of the religious practices of Tibetan Buddhism. 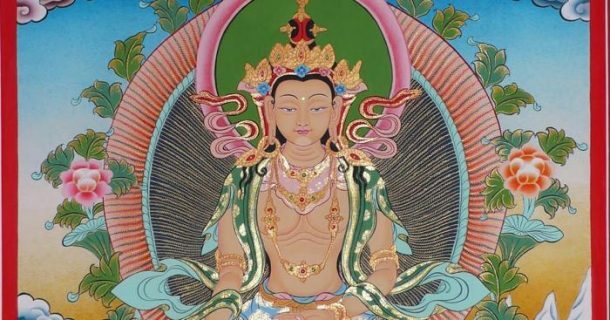 Essentially, another form of Tibetan Buddhism now, New or Modern Bon began when teachers of the Bon religion of the 14th and 15th centuries adopted some of the Buddhist practices taught by Padmasambhava. While the practitioners of Modern Bon regard the religion as an unbroken continuation from the Original Bon, over different stages, it is widely regarded as only having very tenuous links with the Original and Yungdrung stages of Bon. The second stage of the Bon religion, as taught by the Bonpo, Yungdrung Bon is believed to have been founded from Original Bon in around 16,000 BC by a Buddha-like figure known as Tonpa Shenrab Miwoche. 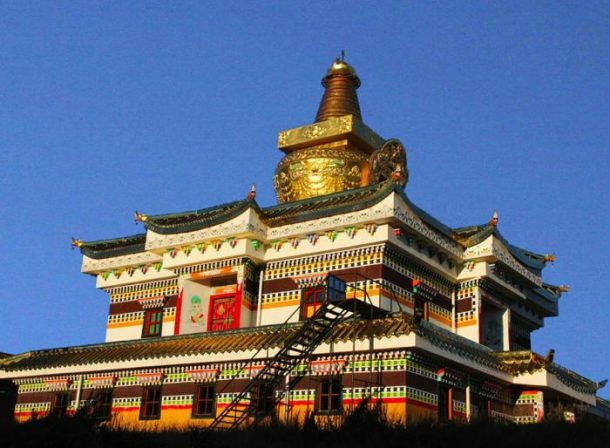 Believed to have lived in the mythical land of Zhang Zhung, somewhere outside the northern edges of the Tibetan plateau, Tonpa is said to have been a prince of the land of Tagzig Olmo Lung Ring, the sacred land known in Sanskrit as Shambhala. Tonpa is said to have renounced his royal station to become a monk, and teach enlightenment to others, converting the unenlightened animistic people of Original Bon to the eternal Yungdrung Bon practices, exchanging offerings of a symbolic nature for the blood sacrifices that were originally being made. It is said in the Bon traditions that Tonpa Shenrab Miwoche lived much of his life in the Zhang Zhung kingdom, which is now believed to be the ancient Shangshung Kingdom of northwest Tibet, close to the area of Mount Kailash in Ngari Prefecture. The Shangshung Kingdom is known to have been a major Bon stronghold, and pre-dates the Tibetan Buddhist culture by more than a thousand years. It is told in the traditions how Tonpa Shenrab came once to Tibet, chasing after horses that were stolen by a demon, and while there, he imparted his instruction on the teachings of Bon to the people he came across. While the teachings were not well received at the time, he prophesied that, when the time was right, his teachings would spread across the entire plateau. This can be seen in the texts of the Tibetan people, mainly in those of the Shangshung Kingdom’s cave paintings and the legends of the first King of Tibet, Nyatri Tsenpo, who came from heaven to the site at Yumbulakang Palace, which was built by the Bon practitioners of the region in around the 2nd century BC. The accounts of the life of Tonpa Shenrab can be found in the three principal termas, the Dodu, the Zermik and the Ziji. While the first two termas were discovered by tertons in the 10th and 11th centuries, the third is said to have been handed down from teacher to disciple throughout the millennia since the death of Tonpa Shenrab, at the age of 82, in the timescale of Tagzig Olmo Lung Ring, which would have made him around 8,200 years old in earthly terms. There is little in the way of actual historical facts and evidence to suggest that Tonpa Shenrab actually existed, outside the termas and legends of the Bonpo. While the Shangshung Kingdom is known to have existed in the period prior to the advent of Buddhism in Tibet, no texts remain to prove the existence of the figure. However, by the 1950s, there were still known to be more than 300 Bon Monasteries across Tibet and the rest of China, suggesting that the religion had been prevalent in the ancient area of Tibet before Buddhism came about. The modern version of Bon has much of the Buddhist practices in it, and was approved by the Dalai Lama in the late 1970s. However, it is clear from many of the practices and texts, that some aspects of the ancient Yungdrung Bon religion were incorporated into Tibetan Buddhism, which is one of the things that make it unique today. Aspects of Yungdrung Bon have also been found in the Hangui Religion of the Pumi People of Yunnan Province of China, a people that are ethnically related to the Tibetan people of the Mili Tibetan Autonomous County and Yanyuan County in Sichuan Province. This does suggest that the religion was around before the advent of Buddhism in Tibet. People travel to Tibet to learn new culture and experience the authentic Tibetan Buddhism. Tibet has some many taboos within regions of Tibet. It has unique culture features which is cherished by international travelers and explorers. Artikel. Es wwar inspirierend Praxis. Haltfen Siie über diee Entsendung!